This article is about a river in western Russia. For the river in Siberia with the same name, see Oka River (Siberia). For other uses, see Oka. 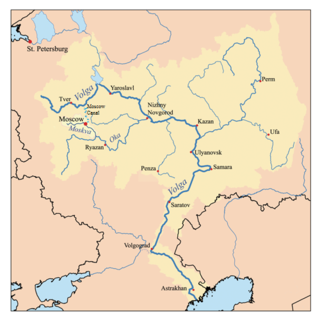 Oka (Russian: Ока́, IPA: [ɐˈka]) is a river in central Russia, the largest right tributary of the Volga. It flows through the regions of Oryol, Tula, Kaluga, Moscow, Ryazan, Vladimir and Nizhny Novgorod and is navigable over a large part of its total length, as far upstream as to the town of Kaluga. Its length exceeds 1,500 kilometres (930 mi). The Russian capital Moscow sits on one of the Oka's tributaries—the Moskva River. The Oka river is the homeland of the Eastern Slavic Vyatichi tribe. By 5th century the land around the Oka river was inhabited by different Slavic tribes. The Baltic tribe of Galindians lived also in the western part of the Oka basin. Turkic tribes also inhabited the Oka area. The Oka river was also inhabited by Vikings and people from Northern lands like for example Scandinavia. Artefacts of Scandinavian origin were found along the Oka - Volga route. There is no common opinion where the name Oka originated from. From the Mongol conquest until about 1633, the Oka was the last line of defense against steppe raiders. The river gave its name to the Upper Oka Principalities, situated upstream from Tarusa. In 1221 Grand Duke Yuri II of Vladimir founded Nizhny Novgorod, later to become one of the largest Russian cities, to protect the Oka's confluence with the Volga. The Qasim Khanate, a Muslim polity, occupied the middle reaches of the Oka (around the city of Kasimov) in the 15th and 16th centuries. Before the construction of the railways in the mid-19th century and the building of the Moscow Canal in the 1930s, the Oka, along with its tributary Moskva, served as an important transportation route connecting Moscow with the Volga River. Due to the Oka's and Moskva's meandering courses, travel was not particularly fast: for example, it took Cornelis de Bruijn around 10 days to sail from Moscow down these two rivers to Nizhny Novgorod in 1703. Traveling upstream may have been even slower, as the boats had to be pulled by burlaks. The banks of the river are dotted with historical and cultural sites, including the medieval monasteries of Murom, the mosques and minarets of Kasimov, the fortified kremlins of Kolomna and Serpukhov, the memorial houses of Vasily Polenov and Sergey Yesenin, the excavated ruins of Old Ryazan and the Oka Shukhov Tower. The Prioksko-Terrasny Biosphere Reserve lies along the left bank of the river opposite the town of Pushchino and is known for its wisent breeding nursery. The River appears as the title and main theme in a popular, nostalgia filled song (in which it is compared to the Vistula river in Poland) of the Polish 1st Tadeusz Kościuszko Infantry Division which was formed nearby in 1943. The unit fought all the way to Berlin alongside the Red Army. It was written by Leon Pasternak. ^ "History of Russia, the Russian Empire, in ancient times, read | we know everything - Mouzenidis Travel". Mouzenidis Travel. Retrieved 2018-11-18. ^ Tarasov, Илья Тарасов / Ilia. "Балты в миграциях Великого переселения народов. Галинды // Исторический формат, № 3-4, 2017. С. 95-124". Балты в миграциях Великого переселения народов. Галинды. ^ Brink, Stefan; Price, Neil (2008-10-31). The Viking World. Routledge. ISBN 9781134318254. ^ Steinwedel, Charles (2016). Threads of Empire: Loyalty and Tsarist Authority in Bashkiria, 1552-1917. Indiana University Press. p. 13. The Moskva River is a river of western Russia. It rises about 140 km (90 mi) west of Moscow, and flows roughly east through the Smolensk and Moscow Oblasts, passing through central Moscow. About 110 km (70 mi) south east of Moscow, at the city of Kolomna, it flows into the Oka River, itself a tributary of the Volga, which ultimately flows into the Caspian Sea. 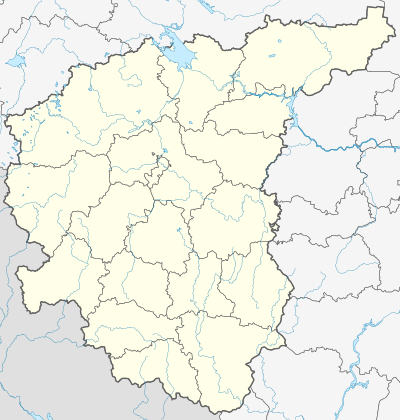 Pushchino is a town in Moscow Oblast, Russia, an important scientific center of the Russian Academy of Sciences. Situated 100 kilometers (62 mi) south of Moscow, and 13 km south-east of Serpukhov, on the right side of the Oka River opposite the Prioksko-Terrasny Nature Reserve. It is informally called Pushchino-on-Oka. Population: 20,332 (2010 Census); 19,964 (2002 Census); 19,479 (1989 Census). Zasechnaya cherta was a chain of fortification lines, created by Grand Duchy of Moscow and later the Tsardom of Russia to protect it from the Crimean-Nogai Raids who, rapidly moving along the Muravsky Trail, ravaged the southern provinces of the country during a series of the Russo-Crimean Wars. It was south of the original line along the Oka River. It also served as a border between the Muscovite State and the steppe nomads. As a fortification line stretching for hundreds kilometers, the Great Abatis Border is analogous to the Great Wall of China and the Roman Limes. Central Economic Region is one of twelve economic regions of Russia. Amand Yegorovich Struve was a Baltic German military engineer and bridge specialist of Russian Empire. Moscow Railway is a subsidiary of Russian Railways that handles half of Russia's suburban railway operations and a quarter of the country's passenger traffic. As of 2009 the railway, which has its headquarters near Komsomolskaya Square in Moscow, employed 73 600 people. It manages railway services in much of Central Russia, including Moscow and Moscow Oblast, Smolensk, Vladimir, Ryazan, Tula, Kaluga, Bryansk, Oryol, Lipetsk, and Kursk Oblasts.